Which one of these 9 critical things do you want the most? 1) Your insurance covered electronically? We will process your claim electronically and you will be reimbursed within a couple of days. We even will extend you 0% financing customized to your budget. We are easy to get to: Located right beside Square 1 (Walmart) at in the Royal Bank Building (33 City Center) – Parking is free. We have patients come in from all over Mississauga and Peel as far as Toronto because of our convenient location. 3) Your kids to have a fun experience and get healthy? We welcome kids of all ages. We love hearing from kids and their parents how much fun they had at our office. 4) To have your dentist care about you and make you feel good? We will call you after your procedures to make sure everything is ok.
We care about your time as well. Thank you to everyone that compliments us on our short or NO waiting times. You are in good hands...Emergencies are handled promptly no matter how busy we are. 5) Availability around your hours? We are available when you have an emergency and open bright and early 5 days a week for your convenience. 6) To ease your fears and help you, even if you are nervous? If you fear coming to the dentist, you are not alone. Whatever your fear about coming to see us, let us know. 1. We will walk you through the entire procedure to make sure you know what’s going to happen. 2. We will tell you what to expect in terms of freezing – which a lot of people are most anxious about. 5. We encourage you to bring an mp3 player to listen to your favourite music. 7) Sterilization of the equipment that will be used on you? 3. After the bath, they are rinsed, dried, then sterilized in a STATIM steam autoclave. 4. Spore tests are done on the autoclave daily to make sure that there is 100% sterilization. 5. Instruments such as handpieces that can’t be immersed in liquid are wiped with a surface disinfectant and are also placed in the STATIM steam autoclave. 6. Hard surfaces like countertops, hoses, etc. are wiped with a surface disinfectant twice – the first time to remove debris; the second, to disinfect. 8) Doesn’t make you feel bad for forgetting to floss or brush once in a while ? We know it’s unrealistic to expect everyone to brush and floss everyday. If you forget once in a while, we understand. And that is why we won’t judge you and when you come in – we are here to help. 9) An experienced, friendly and courteous staff? 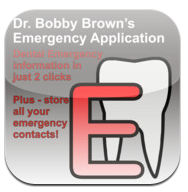 Dr. Bobby Brown, general dentist in mississauga, has been practicing over 31 years. All the staff at Bobby Brown and Associates Dental is friendly, respectful, and really enjoy what they do. We are always friendly and laughing and will treat you with respect. Don’t you feel safer knowing that the dentist you have chosen has been keeping families like yours healthy for many years?